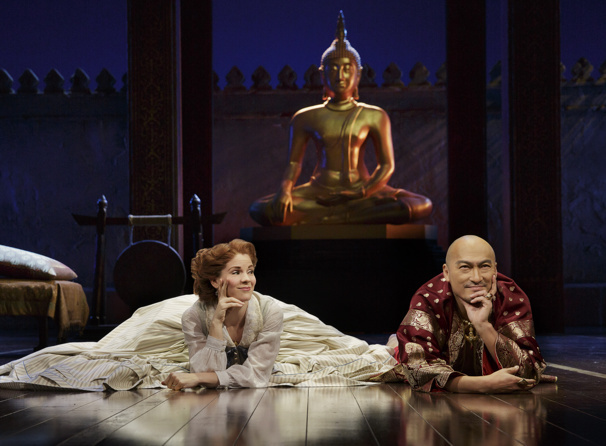 Kelli O'Hara & Ken Watanabe in "The King and I"
Lincoln Center Theater's Tony-winning production of Rodgers & Hammerstein’s The King and I, currently debuting in London's West End, will be released in cinemas around the world this fall via Trafalgar Releasing. The King and I: From the Palladium, filmed onstage at the iconic London Palladium, will open in cinemas globally on November 29 with an encore presentation exclusively in the United States on December 4. This mounting of The King and I first opened on Broadway in 2015 at Lincoln Center Theater's Vivian Beaumont Theater. The staging then transferred to the London Palladium in June of this year, with three of the original Broadway lead actors reprising their starring roles—Kelli O’Hara in her Tony-winning turn as Anna Leonowens, Ken Watanabe returning to his Tony-nommed performance as the King of Siam and Ruthie Ann Miles reprising her Tony-winning turn as Lady Thiang. All three actors will appear in the filmed presentation. Set in 1860s Bangkok, the musical tells the story of the unconventional and tempestuous relationship that develops between the King of Siam (Watanabe) and Anna (O'Hara), a British schoolteacher whom the modernist King, in an imperialistic world, brings to Siam to teach his many wives and children. Tickets to The King and I: From the Palladium will go on sale on August 31.